The PMON process registers service information with the local listener by default. For most uses this is all that is needed to successfully connect to the database for use. If you are using a database release earlier than 8i or you need to remotely start the database from a tool other than Enterprise Manager, you will need to configure static service registration. Below is the output from starting the listener. Note that currently the listener supports no services. At this time the listener has no services registered because there are no databases running and there are no statically registered services. Below we start the database and check the status again. Service "orcl" has 1 instance(s). Service "orclXDB" has 1 instance(s). After starting the database we can see that the database has been registered with the listener. We will use Oracle Net Manager to statically register the database with the listener. 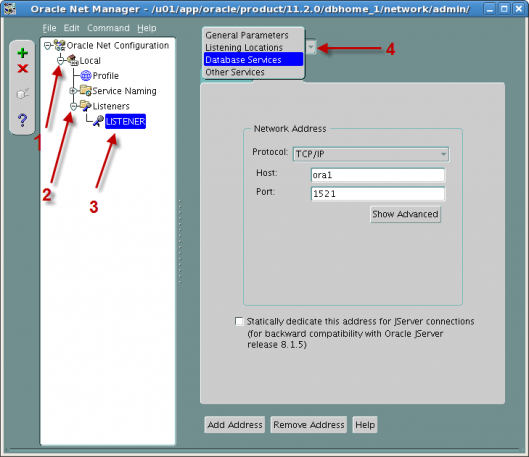 If your ORALCE_HOME and PATH are set properly you can start Oracle Net Manager with netmgr. Under the Oracle Net Configuration node do the following. On the Database Services screen click the Add Database button. Set appropriate values for Global Database Name (DB_NAME.DB_DOMAIN), Oracle Home Directory and SID (INSTANCE_NAME). Note if you are using Transparent Application Failover (TAF) or connect-time failover do not set the Global Database Name. To save the changes select File and then Save Network Configuration. 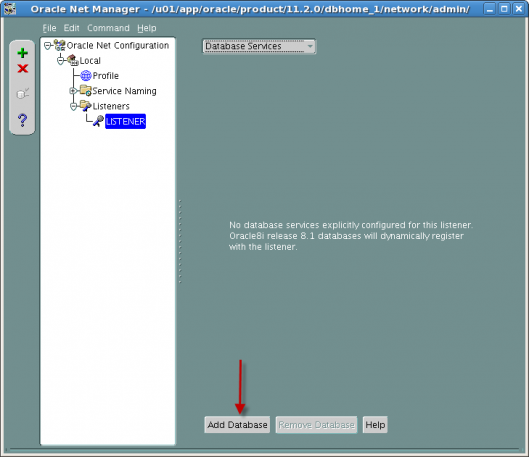 Once you save the changes you can close Oracle Net Manager. If your listener is running you will need to issue the reload command for the listener to see the changes made. You should now see that a service is registered. We will now restart the database to see the changes in the services. Service "orcl" has 2 instance(s). Even though the database is statically registered, it still registers dynamically with listener. In the case of both static and dynamic registration, the listener uses the dynamic registration information before using static service registration information. Below are listing of the listener.ora file before and after changes were made using Oracle Net Manager. Contents of the listener.ora file before changes. Contents of the listener.ora file after the changes. Keep in mind that for most uses, dynamic registration should be all that you need. Thank you for visiting the site. I am happy you found the post useful. But when we add more than one database to static registration it is giving error in netmgr as “please add listening locations” & in the listening window it is not allowing default port number 1521, is there any special reason for this? Can we do the static registration of more than one database on the same host with default listener? Kindly reply for the question, i have googled a lot for finding out this ! The error you mentioned “please add listening location” has to do with the Listener itself and not a statically registered database. Is the listener set up correctly? To answer your question, the default listener or non default listener can have multiple statically registered databases. Below is the section from the listerner.ora in the post. The SID_LIST section is for static registration and in the case above only one databas is statically registered. To statically register adidional database to this listener you can follow the steps outlined above or add the following after the (SID_NAME=) parameter. Replace < db_name >, < ORACLE_HOME_PATH >, < db_sid > and with values for your environment. If you are still having problems you can either post your listener.ora file or send it to me at eric.jenkinson@oracledistilled.com and I will take a look to see what the problem. Thank you for visiting Oracle Distilled. I did the changes as you mention in your post and it worked for me! First my Thanks and really Well Explained. Service “myorcltest” has 1 instance(s). Instance “orcltest”, status UNKNOWN, has 1 handler(s) for this service..
Service “orcltest” has 1 instance(s). Service “orcltestXDB” has 1 instance(s). Service “orcltest_XPT” has 1 instance(s). Why i am getting two different status ( what’s is the logic behind) here .. In my case , please provide clear explanation .. Previous Previous post: I just got/found an ORA-00600 after doing < X >. What should I do?